Tell friends about ArtPlus software! To download featured skins run EasyNoter, right-click on it's covers, select "Change Skin" and then click "Download New Skin" button. Ad supported EasyNoter - free of charge forever! Once installed, your program will never expire! It will just display some ads as long as you wish to use it in free mode. Special offer: Buy Ads-Free EasyNoter License Now at 60% Discount! 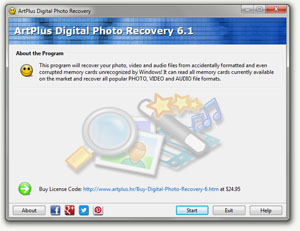 Special offer: Buy ArtPlus Digital Photo Recovery now for only $9.95! 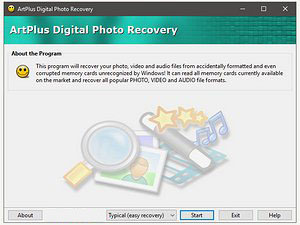 ArtPlus Digital Photo Recovery tool can help you recover lost images, videos or music files from corrupted or accidentally formatted digital camera or mobile phone memory cards. Click HERE to learn more but remember to return to this page to take advantage of this offer. Special offer: Buy Permanent EasyNoter License now for only $9.95! You appear to be reading this on a mobile device. This software is designed for Desktop Windows 7 / 8 / 10 PC! You should probably revisit on your desktop PC. Send yourself an email with the link to complete the download later.